Me, me and only me. Yesterday I went downtown, somewhat apprehensively, to see Todd Hayne's film, "I'm Not There" at The Pickford. There was a sign on the ticket window with an apology. The film hadn't arrived in time for the 12:50 showing. I drove downtown again for the 3:40 show, where there were plenty of empty seats. The hour that the ship comes in . . . "
The 37-song soundtrack introduces me to the music of a distinctive assortment of younger voices singing Bob Dylan songs, including a teenage actor from the film, Marcus Carl Franklin, as well the older voices of Richie Havens, Willie Nelson and Rambling Jack Elliott. And I have no trouble at all understanding how a person could find nothing good at all to say about Todd Hayne's film or Bob Dylan and his music. It's just the same as talking to you . . . "
But oh, mother, things ain't going well . . . "
In case of any confusion, the above photo is of Bob Dylan and one of his children. In "I'm Not There," Heath Ledger played the part of Jude Quinn / Bob Dylan and looked very much like Bob Dylan in the above photo. 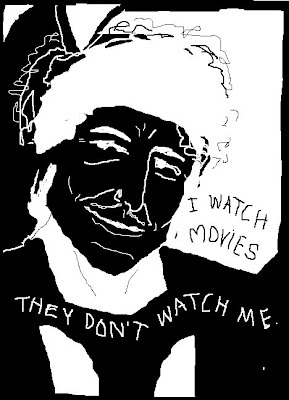 No man can see Bob Dylan through a woman's eyes, just as no woman can see Bob Dylan through a man's eyes. Perhaps that is the genius of Cate Blanchett playing the role of Jude Quinn / Bob Dylan in a way that is as unforgettable to me as Bob Dylan himself. A flock of Canada Geese going in a southwesterly direction just passed overhead. 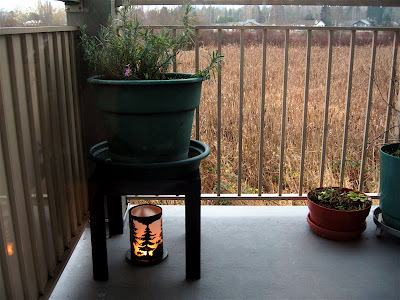 Almost every morning when I wake up before dawn, I light the candle lantern on my porch. It's dark and rainy this morning. 35 degrees. Snow is predicted in the coming days. If you click on the image, you will see the rain suspended on the railing. 'Ain't Talkin' is one of my favourite later Dylansongs. A week ago I bought tickets to see Dylan in Sheffield Arena next April. On the ground floor - and not too far from the front either!